No building on Central Park West has more balconies fronting on Central Park than this 25-story tower, the second-tallest post-World War II residential tower on the avenue. The balconies are clearly the main attraction in this beige-brick building that bears little trace of the fabulous architectural heritage of Central Park West's great residential towers. The south corner balconies wrap around the corner to take maximum advantage of the spectacular views and these apartments are extremely desirable. 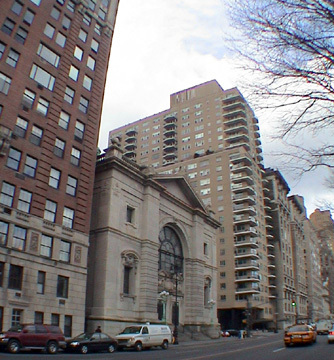 It is directly across 68th Street from the Second Church of Christ, Scientist, a green-domed low-rise religious structure that affords this building improved views. Its location, close to Lincoln Center and the park transverse roads, is hard to beat, however, and it has a large and attractive lobby. Built in 1967, the building's 173 apartments were converted to cooperatives in 1979.